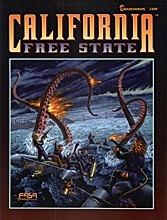 California Free State ist ein Quellenbuch für die zweite Edition von Shadowrun. Es beschreibt ausführlich den Freistaat Kalifornien und ersetzt damit die entsprechenden Informationen aus dem älteren "The Neo-Anarchist's Guide to North America", die nicht in der deutschen Übersetzung in der Kompilation "Nordamerika Quellenbuch" enthalten waren. Das Buch wurde von FASA 1996 in englischer Sprache veröffentlicht, und nie ins Deutsche übersetzt. Am 28.08.2010 erfolgte eine Wiederveröffentlichung des Quellenbuches als eBook durch Catalyst Games Lab. "Which California are you comin' to for biz, chummer? The Central Valley, ground zero of the water wars between small famers and big corps? Green-and-gorgeous Northern California, with a thousand mutually hostile small towns and crack Tir troops stepping right up to the tripwire? Or try your luck along the Big Sur coastline--you can either die from environmental poisons or get carved into tiny pieces by the pirates and smugglers who own the place. How about Los Angeles, where rich simsense stars and even richer producers live just the other side of a placrete wall from starving ork kids and strung-out chipheads? The CALIFORNIA FREE STATE sourcebook describes the country of California. It features the movers and shakers, the hot spots, the war zones, the strange magic and the deep dark shadows of this independent nation that seems alwasy on the brink of civil war. This sourcebook describes life throughout the Free State, focusing on Los Angeles, San Francisco, and the magic-rich Mojave Desert. A must for any California campaign, the CALIFORNIA FREE STATE sourcebook provides a wealth of adventure hooks, story starters, and rules for using them in your SHADOWRUN game. Also included are new rules for mutant critters, magical oddities, and toxic beings unique to California. For use with SHADOWRUN. Diese Seite wurde zuletzt am 1. Juli 2013 um 15:45 Uhr geändert.